With Ofqual introducing new grading systems, new topics and a changing emphasis on skills, GCSEs and A Levels are going through the biggest reform in a generation. 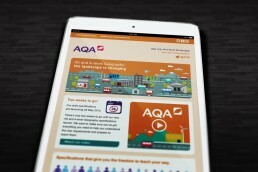 For exam boards like AQA, that meant a major communication challenge, to help existing school customers understand and prepare for the changes – and an opportunity to attract new schools. 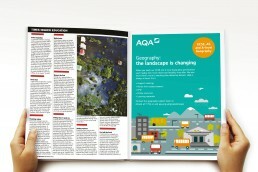 AQA’s Geography team approached Bell to help it address these twin objectives. Bell developed a single overarching campaign concept for both audiences. The central message was “The landscape is changing”, and we used a wide range of channels to both alert schools to the changes, and help them understand them. 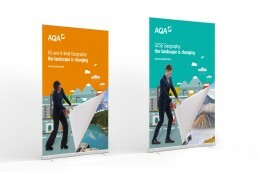 These included online and ofﬂine advertising, emails, data capture cards, pull-up banners and succinct animated ﬁlms. 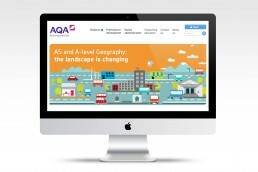 At each point, the communications emphasised how AQA’s resources would help them through the changes. Targeted emails led to impressive success rates, with large numbers of schools downloading early materials and registering for updates. The campaign went live in early 2015 and will run right through until the ﬁrst exams take place in 2018.